While discussing this project with my wife last night, I posed the question to her about how many levels should be contained in the game. During our short and informative conversation about this topic, it was brought to my attention that unless a player could somehow resume their previous game, they’d soon tire of having to redo levels just so they can beat them all. This made me ask myself how I could effectively allow the player to continue a previous game and the answer wasn’t all that surprising. I’ve noted that in a lot of puzzle type games, once you select the game type, you are often presented with a level selection screen. The screenshot of the new level select screen follows, but there’s a little bit more to it than what you see in the screenshot. I’ve been pondering over the idea of a global scoring system, and with the creation of the level select screen, I’ve decided to pretty much scrap that idea. The game’s built for golf style scoring, but it’s not really the total score that matters, but whether or not you can beat the level at or under par. Instead of tracking the lowest scores, I’m just going to track par. On the level selection screen, if you have previously beaten a level at or under par it’s button will appear green. If you’ve played the level before and beaten it over par, the button will be yellow. Finally, if you’ve never beaten the level before at all, the button will be red. This way, the player’s goal should be to turn all the buttons green. 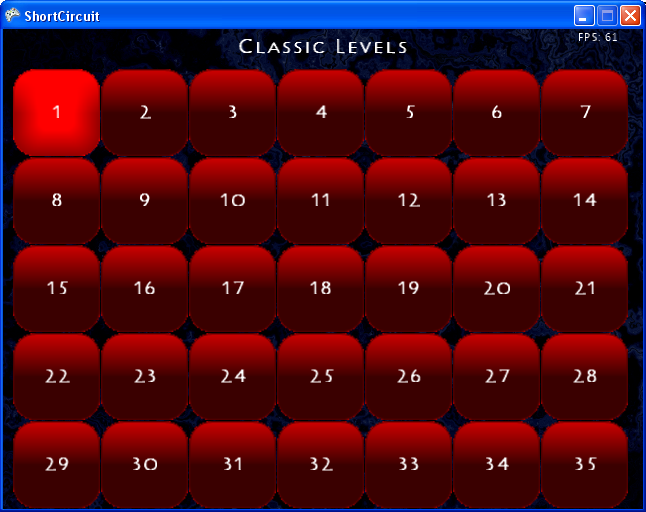 You’ll also notice that in the following screenshot there are 35 levels. That is not a mistake, those levels have actually been created and play-tested. There are 35 levels in the classic game mode. I’ve also built in 5 classic demo levels and 5 advanced demo levels in case I decide to publish a demo version of the game.